AMHERST, Ma. – Arriving on campus for his upcoming lecture, former Speaker of the House Newt Gingrich expressed excitement for his recent contract with Amherst. In addition to the former Speaker’s exorbitant receipts, notable stipulations in Gingrich’s contract with Amherst include six adjoining rooms at the Lord Jeffery Inn, a personal beverage attendant, three bowls of Peanut M&Ms Candies (no blue M&Ms), and transportation to and from Bradley International Airport in Robert Lucido’s personal limousine. 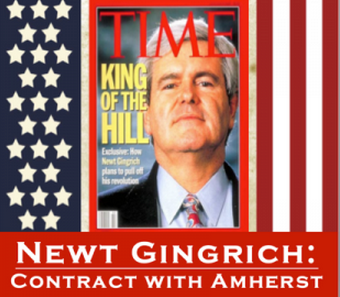 Gingrich hopes, however, that his trip will be worth more than just his contract with Amherst: he and his wife Callista will be selling and signing books after the talk. This entry was posted in Politics by deputymetroeditor. Bookmark the permalink.